18 to 23m². Classic room overlooking the main patio. From Friday 10 May 2019 until Friday 20 September 2019: Enjoy 54 % off! From Saturday 21 September 2019 until Thursday 31 October 2019: Enjoy 45 % off! From Friday 1 November 2019 until Friday 20 December 2019: Enjoy 54 % off! 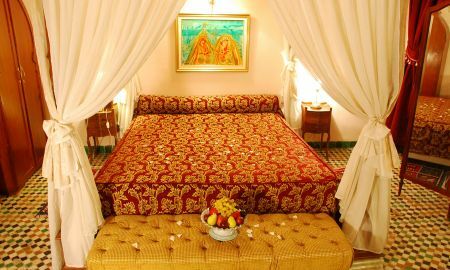 Elegant suite with bedroom, double bed and sitting area offering all the comfort you need for a pleasant stay in the historic city of Fes. From Friday 10 May 2019 until Friday 20 September 2019: Enjoy 56 % off! From Sunday 14 April 2019 until Thursday 31 October 2019: Enjoy 50 % off! From Friday 1 November 2019 until Friday 20 December 2019: Enjoy 56 % off! Elegant suite with sitting area, fireplace, bedroom, and double bed. "Lalla Rkiya" suite is a luxury and spacious suite, consisting of 3 bedrooms each with double bed and 1 private room with fireplace. 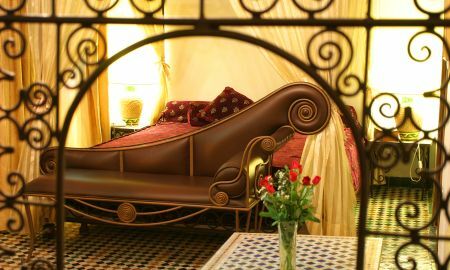 Located in the heart of the Andalusian neighbourhood in the old medina of Fes, Riad El Ghalia is an enchanting palace of the 19th century belonging to a family of notables. Set around the central patio, all rooms at Dar El Ghalia feature a luxurious oriental design that will take you to a true story of a thousand and one nights. Faithful to its culinary tradition, this ancient palace houses the famous restaurant "Dar Tajine" and offers a refined menu to discover the true Fassi cuisine, the most famous in Morocco. You can also taste delicious family dishes carefully prepared under the watchful eye of the hostess. From the terrace, you can overlook the old town and plunge into its heart. The view over the medina and its many minarets is splendid, especially at sunset when the calls to prayer come from all sides. For your major events, Riad el Ghalia opens the patio (covered and heated in winter) where you can organize business dinners and evening galas. After a long day of work or sightseeing, the Riad prepare for you a Hammam session with massage and manicure to refresh your body and awaken your senses. 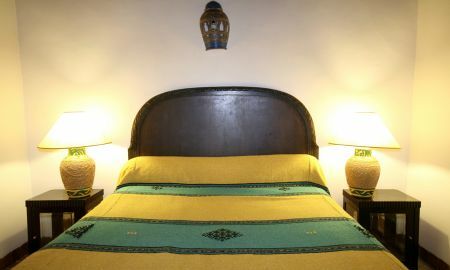 Riad El Ghalia is located in the heart of the Medina, near the major monuments (Museum Batha Nejjarine, Mederssa Bouanaia, Méderssa Attarine, Karaouyienne University), tanneries and souks of the city.